Common mistakes sink the best intentions, but being aware of them can help you take them head on. There are a lot of good reasons to start a restaurant. A passion for food. A clever restaurant concept. A family recipe that will reel in customer after customer. But there are just as many, if not more, pitfalls that can trash a restaurant before it’s been open for a year. Some of the mistakes are obvious, but others can sneak up on both fresh-faced rookies and established restaurant owners. Opening a restaurant is neither cheap nor easy. No matter how much money a restaurant starts out with, it never seems like it’s enough. Many owners think to save up for the obvious costs like rent, equipment and staff. But soft costs—things that most owners don’t think of—can nibble your nest egg to the nub. Permits, fees, applications and all sorts of red tape costs time as well as money. Professionals recommend a 10-15% emergency fund above your initial budget to cover the things you don’t expect but will likely happen. Going to find outside partners is fine, but ensure everyone clearly understands who gets what out of the deal. Take a moment to consult with a lawyer before agreeing to anything. Even if you don’t have friends who will do it for free (or a free meal or two), spending the money for a few billable hours will save you money in the long run should things go wrong with the partnership. The financial pain now will be worth it to skip any headaches should you decide to sell your restaurant. One great way to save on capital expenditures? Rent your commercial water heater. Avoid spending thousands on a new water heater or blowing thousands on costly repairs. You can rent a commercial water heater for an affordable monthly fee, plus you get 24/7 service when your hot water equipment breaks down. 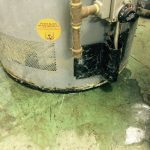 Inheriting a used commercial water heater? Don’t risk it! Try an affordable service plan today. Read more here: Why Would Anyone Rent a Water Heater? The more choices, the more people will eat at your place, right? Maybe if you’re opening an all-night diner and even then, most customers are only looking for something that will pass muster post-bar time. It’s better to be a specialist than a generalist in the restaurant business. The fewer items on your menu to start, the more you can concentrate on getting those items right. Customers hunger for a specific type of food when they go out to eat. The more specific you are, the more likely that customer will think of you when their stomach is in charge of their wallet. Good owners have a good concept in mind when starting a restaurant. Great owners know when to modify that concept during the building period. It’s easy to think that once you’ve opened, good reviews and word of mouth will draw customers from all over to eat your dishes. Paying attention to your market is a necessary first step. Downtown restaurants, for example, that have fast, quick lunches for office workers on the go will likely lure customers back after work when everyone needs a drink or two to wind down. You might have a customer in mind, but first you’ve got to claim the customers you can get. Much of an owner’s plan for a restaurant resides squarely inside the head. The owner has a lot of responsibilities and, as such, should be handling them. The owner shouldn’t also be cooking, seating guests and unclogging the toilet. Getting in the way of your staff may seem like it’s helping, but it’s really telling the people you hired that you don’t trust them to do their jobs. Morale in the fast-paced service industry is already a fragile thing. A good way to work out the kinks, develop procedures and get some practical experience is to plan a soft open. There’s a reason most theaters have dress rehearsals before the production claims and opening night. There’s a big difference between running through the motions and doing it with unpredictable customers and contact with the public. Once you have your procedures ironed out, write them down. Make sure your employees stick to the right portions and measurements you choose. When you’ve drilled your team to do things one way, they’ll know when they’re right and when they’ve made a mistake without you having to yell at them. A good location can make the difference between a thriving restaurant and an endangered one. Market awareness when selecting a location is key here. Operate near a campus and you’ll want simple, easy fare that students can grab and go. An Italian restaurant near an affluent subdivision should have excellent wine on the menu. If you’re willing to be flexible, add some items to your menu that fit your location and the customers that walk by. If your vision is unimpeachable, waiting for the right location might be a better option. There is often a temptation to pick a location solely based on the rent. Lowered rents are there for a reason. A bad location means customers have to hunt to find you, which is usually not something people want to do on an empty stomach. Getting the word out about a hard-to-find location through signage, advertising and other methods might soak up whatever savings in rent you have, combined with the loss of clients who don’t want to go out of the way to find your kitchen. Starting a restaurant isn’t for everyone. It takes passion, patience, and determination. A little bit of luck never hurt, either. Common mistakes sink the best intentions, but being aware of them can help you take them head on. Be ready to spend a little more money than you think you need. Focus on your menu, your concept and whatever else makes your restaurant a destination. Once you’ve got your rules down, write them down so you don’t forget them or forget to hold your employees to them. Make sure your location fits what you’re selling to get people in the door. Every little bit helps. Avoiding common mistakes means you’ll have more time to deal with the unexpected. Best of luck, restaurateurs! Image “Open” courtesy of Flickr user Clarence licensed under CC by 2.0. Featured Image “Fish and Game’s Scotch Corner” courtesy of Flickr user TheArches licensed under CC by 2.0. Image “Cafe Rouge” courtesy of Flickr user Surreal Name Given licensed under CC by 2.0. The article is very relatable and easy to understand, it comprises of everything that a restaurant owner should be aware of. I especially liked the content under ” Trying To Be Everything to Everybody”. It is always better if you are already aware of the various mistakes that aspiring restaurateurs generally commit so that you can avoid making the same blunders and many do. Hence, below we have listed the top 8 restaurant startup mistakes that can trap your restaurant and resist its blossoming growth.